A neat cookie jar tractor shape would be a great addition down on the farm!. It is either a regualar tractor or possibly a lawn mower tractor. 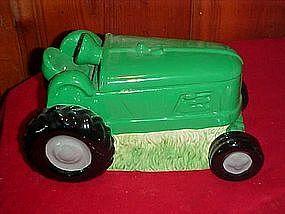 Hand painted glazed ceramic in a pretty John Deere green. Measures 6 1/2" tall and is about 10 1/2" long. Perfect condition with no damages. Suitable to make a wonderful gift! Made in China.